This entry was posted in News, Patient Information Leaflets on April 4, 2019 by admin. This entry was posted in News, Patient Information Leaflets on March 28, 2019 by admin. 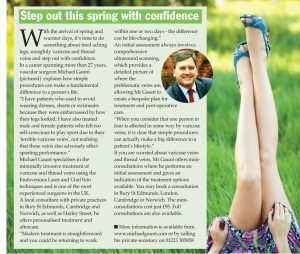 Michael Gaunt explains why he performs his venous treatments within a hospital setting. There is an increasing trend for venous treatments to be performed in small stand-alone doctor-owned clinics providing treatments under local anaesthetic only. Although I am a great fan of local anaesthetic techniques – and indeed our pioneering use of short-acting nerve blocks provides excellent intraoperative and postoperative anaesthesia and analgesia – local anaesthesia is not appropriate for all clinical situations. With extensive bilateral varicose veins, infiltrating large amounts of local anaesthesia can itself be painful. Other patients may have an anxious disposition or may have had a previous bad experience with local anaesthetic. In these cases, it is useful to be able to offer a general anaesthetic option and this can only be administered safely within a hospital setting, with all the safety and reassurance of full back-up facilities and specialist colleagues available. This entry was posted in News and tagged hospital, private clinic on March 25, 2019 by penny. Mr Michael Gaunt has been recognised for his excellent services by winning the BUPA Patient Satisfaction Award. All BUPA UK patients provide feedback and a rating of the treatment they have received from their consultant. We are always pleased to hear customer feedback and strive to provide the highest clinical standards combined with a friendly and relaxed environment. Mr Michael Gaunt’s overall rating from BUPA patients was ‘excellent’ – the top rating. Totally independent feedback such as this is very useful for consultants as it provides an accurate measure of the quality of care they provide. This entry was posted in News and tagged award, BUPA, patient care on March 25, 2019 by penny. This entry was posted in News, Patient Information Leaflets on March 23, 2019 by admin. Confused about specialist vein treatments? This entry was posted in News on March 13, 2019 by admin. Embarrassed by red thread veins? Do you long for clear unblemished skin? 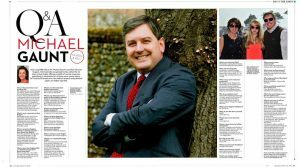 Leading consultant vascular surgeon Michael Gaunt says modern treatment methods offer a quick and effective solution. This entry was posted in News and tagged cosmetic, spider veins, thread veins, wellbeing on March 13, 2019 by admin. This entry was posted in News, Patient Information Leaflets on February 14, 2019 by admin. This entry was posted in News, Patient Information Leaflets on January 2, 2019 by admin. This entry was posted in News, Patient Information Leaflets on November 12, 2018 by admin.